This recipe is from a recipe booklet I bought in New Zealand straight after tasting muffins for the first time in a café. That's why the measurements are in cups! Makes 12 medium muffins - you'll need a non-stick, preferably silicon, muffin mould or tin, or you could use paper baking cases. 2. Measure the grated cheese, self-raising flour, salt, mustard powder, sugar and cayenne pepper into a large bowl. Mix lightly with fingertips to combine. 3. In another bowl beat the egg and milk until evenly combined. 4. Pour all the liquid onto the dry ingredients, then fold the two mixtures together, taking care not to over-mix. 5. Spoon mixture into muffin mould. 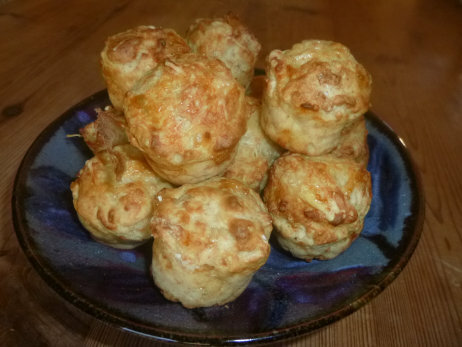 Optionally, sprinkle a little extra cheese or paprika on the top of each muffin. 6. Bake for about 12 minutes until muffins spring back when pressed in the middle and are golden brown. 7. Let the muffins stand in the mould for 3-4 minutes - they loosen themselves in this time. Press gently with several fingers of one hand and twist slightly to loosen and remove them to finish cooling on a cooling rack. Best served warm, soon after baking.